Jim Zub and Steven Cummings’ Wayward ongoing comic series from Image has been optioned for television by Manga Entertainment, the UK-based co-producer and distributor of several anime franchises such as Ghost in the Shell and Street Fighter Alpha. The blurb here says the series might be anime or live action, but if they’re looking for my vote, I think this Tokyo-based tale about a teenagers with supernatural abilities would look pretty good as an animated series. WAYWARD is an action-drama set in modern Tokyo where Yokai, Japanese creatures and spirits of legend, battle against teenagers imbued with newfound supernatural power. The series launched to critical acclaim in August 2014 and is currently available in monthly comic format and four collected trade paperbacks, with a new deluxe hardcover collection arriving in July. 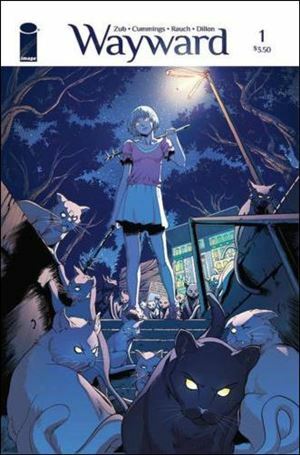 WAYWARD’s first volume, ‘String Theory’, made the Young Adult Library Services Association’s 2016 List of ‘Great Graphic Novels for Teens’ and has been favorably reviewed by many outlets, including Kirkus. Zub is a Harvey and Shuster Award-nominated comic writer (AVENGERS, DUNGEONS & DRAGONS, SAMURAI JACK, FIGMENT). His other creator-owned titles, GLITTERBOMB and SKULLKICKERS, are also published by Image Comics, the third largest comic publisher in North America and publisher of The Walking Dead.